Location/ Directions: Traveling on I-80/I-90: Follow I-80/I-90 and exit at SR 53, exit 91. Turn right onto SR 53. Follow SR 53 for approximately 2.5 miles to US 20 E. Turn left onto US 20. Follow US 20 E for 7 miles. 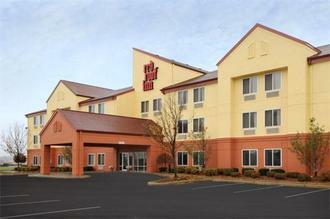 The Red Roof Inn is on the right side of the road, approximately 3 miles past the end of the bypass. About Hotel: 3-Stories, 68-Rooms, Interior Corridors, This location has a 24 hour Cancellation Policy by 6pm. This location offers a fitness center on site, free wireless internet access in all rooms, suites, a coin laundry facility, microfridges for a nominal fee, free continental breakfast, free coffeehouse-style coffee and tea, an in-room hair dryer, an in-room safe, an elevator and interior corridors. One well-behaved family pet per room is welcome. Railroad View: Fair view from fall to spring. Expect summer view to be a poor view due to a corn field behind motel. Tracks are 1,500 feet from the motel. Though trains can easily be viewed from the rear rooms of the motel, binoculars or zoom lens would be needed to read engine numbers. 2nd or 3rd floor rooms may help the view in summer (growing season). Railroads past Hotel: Norfolk Southern / Wheeling & Lake Erie Railway. Notes: This is a new motel. Though we didn't yet stay in this motel, we spotted it in October 2010. The corn field was already plowed down for the year which gave a clear view of the railroad from the motel at ground level. We expect to rate this motel in 2011 along with a complete review. Comments: Motel is minutes away from Bellevue, Ohio, a railroad "hotspot" which includes the Mad River Railroad Museum, a "must see" if you’re in the area. Norfolk Southern & W&LE freight trains do pass the museum.